Location: 378 Rosary Heights Rd. Pastor: Rev. Kevin McGrath, O.P. Associate: Rev. Edmund Ditton, O.P. In Residence: Rev. Luke Tancrell, O.P. Sundays — Sat evening: 5 p.m.; Sun: 11 a.m. 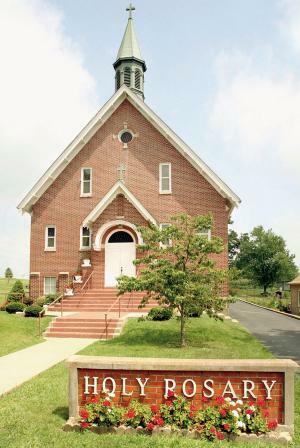 Without a church of their own, African-American Catholics in Washington County were subjected to the lamentable practice of segregation by race, even within the church. To restore their rightful dignity, a church was established west of Springfield in 1929. On April 26, 1930, the church of Our Lady Queen of the Most Holy Rosary was formally dedicated as a mission of St. Rose Parish. Father L.L. Bernard, O.P., vicar for Holy Rosary, acted essentially as pastor for over thirty-five years. He fostered parish pride through self-help and through sports competitions. Dominican Sisters opened an elementary school in 1934. From its three classrooms, two generations of students went forth, well prepared to assume responsibility anywhere in the world. In 1966, the school closed. A fire of suspicious origins destroyed the church in November 1933. Reconstruction began immediately with the great effort of parishioners and the help of friends. Archbishop John Floersh dedicated the present church on August 14, 1934. Holy Rosary became a canonical parish in 1973. An elevator installed in 2001 made the church handicap-accessible. The men’s club added two large rooms for religious education. There is a building fund for a future parish life center. Today Holy Rosary Parish is thriving with strong African-American lay leadership, and its first African-American pastoral administrator, who served from 1998 to 2015. About 600 parishioners—generational African-American families and several others—form a church of mutual care, sacramental life, and growth in hearing the word and doing outreach. Besides the choirs, youth programs, senior ministry, and men’s and women’s clubs, parishioners take leadership in civic and community organizations. The annual homecoming picnic, held the first Saturday in August, attracts thousands of people from thirty states.